Acidophilus Pearls™ / 30 caps - Nature's Way®. 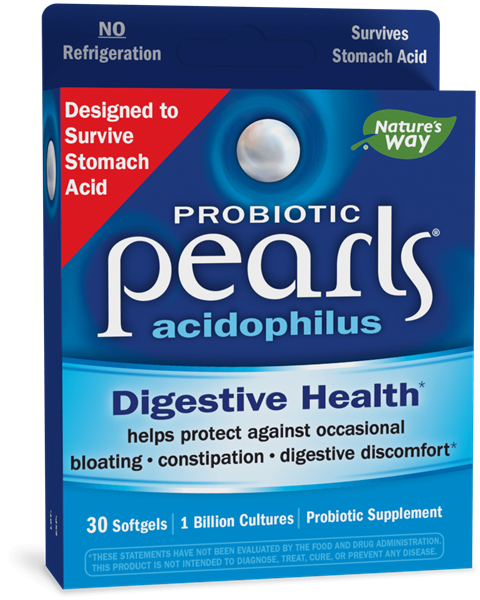 Why use Probiotic Pearls™ Acidophilus? Probiotic Pearls Acidophilus delivers active cultures where you need them - guaranteed. Take 1 softgel daily. May be taken with or without food. Do not chew or crush. If taking any medications, consult a healthcare professional before use. In the USA, NCFM® is a trademark of the North Carolina Agriculture Foundation, Inc. NCFM® is used under license. How much palm oil is in Acidophilus Pearls™ ? Why is it in the product? Palm oil is a natural plant product that is produced from the fruit of the oil palm, or Elaeis Guineensis tree. The exact amount of palm oil in Acidophilus Pearls ™ is proprietary. However, it is a miniscule amount per pearl; the amount is less than the weight of an apple seed. Palm oil in Acidophilus Pearls actually “seals” the probiotic bacteria in the capsule, which protects them from air. Probiotic bacteria are anaerobic, meaning they do not require oxygen to live. In fact, the presence of oxygen can actually injure or kill probiotic bacteria. In addition, the palm oil's ability to seal the bacteria in the capsule eliminates the need for the nutritional supplement to be refrigerated – though they can be kept in the refrigerator if desired. What is the outer coating of the Probiotic Pearls ® Acidophilus made of? The outer coating components are part of the True Delivery™ Technology system, which protects the probiotic bacteria from the harsh stomach acid so that they can be released into the intestines. The coating ingredients, pectin and gelatin, are listed on the label. Why do you use only two bacterial strains in your Acidophilus Pearls™ product? The two most clinically studied forms of probiotics (L. acidophilus and B. longum) are the strains that were selected for inclusion in Acidophilus Pearls. Both have demonstrated benefits for digestive health, with no significant adverse effects. Additionally, both strains are very hardy and stable. This is very important. With Acidophilus Pearls, unlike many other products on the market, we guarantee that the probiotics remain alive and viable throughout the shelf-life of the product - not just at the time of manufacture. The patented delivery system of the pearl ensures that the bacteria survive transit through the stomach to colonize in the intestines. We do not feel that there is a need to include other bacterial strains - our focus with this product is to deliver the most beneficial probiotics, in the amount we guarantee on the label, to the place in the body where they are needed. Why does Probiotic Pearls ® Acidophilus active cultures contain only 1 billion bacteria? Some other probiotic supplements contain several billion. Our company offers many different probiotics in different amounts to suit different needs. Probiotic Pearls ® Acidophilus offers 1 billion cfu, the general daily recommendation, in a tiny pearl-shaped capsule. This amount confers health benefits because the probiotics are protected from heat, moisture, and stomach acid so they can arrive intact in the intestines. Does it matter when I take Probiotic Pearls ® Acidophilus? Take them with meals, between meals, or whenever it is easiest for you to remember.